Each year the National Arboretum brightens up the cool winter with a colourful knitted installation. This year features New Zealand flora and fauna and includes a giant kiwi and groves of bright pohutukawa flowers. You will find warm trees wrapped in multicoloured scarves in many of the forest from the towering Himalayan Cedars, the Camden White Gums to the small bonsai trees. See our website for more details about knitting workshops held in the month of July. 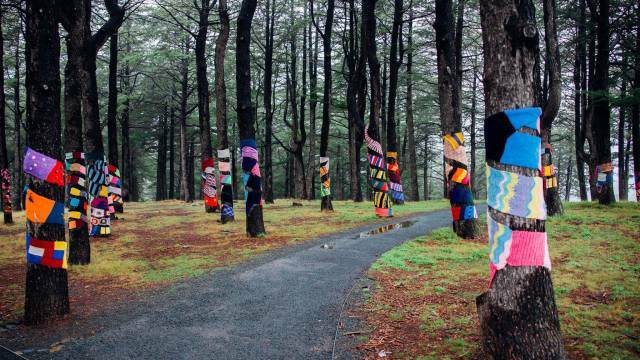 Warm Trees is the combined effort of hundreds of knitters of all ages, in the ACT and all around Australia and overseas and is the largest knitted installation in the world. Brought to you by the Friends of the National Arboretum.